Setting Business Goals- Simply, Effectively, Successfully! 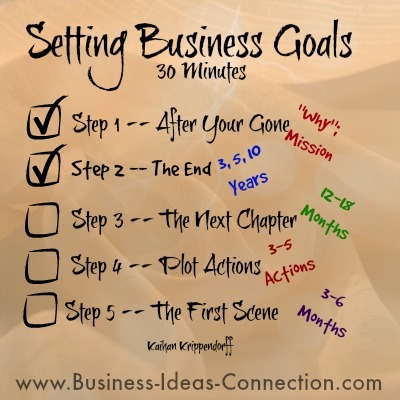 Setting business goals -- want to get down to business and set your goals in 30 minutes? Follow this simple process and begin to get your goals laid out quickly, simply, and effectively within a few short minutes. When it comes to setting business goals, there can be a mental block. It's like "Okay, I'm suppose to be 'planning' now, but what does that even mean?" Guys can easily figure out how to pick their Fantasy Football team or a gal can figure out the best way to plan a surprise birthday party, but we freeze up at the thought of actually planning our business . . . The football team and the party each require similar me skills . . . I just read this article which I really breaks the goal setting process down to a simple process and I wanted to share some of the thoughts with you. I hope this helps to clarify the goal setting process for you and allows you to begin to do it easily and simply in your own life. Kaihan's approach draws from a couple of my favorite books, "The 4-Hour Work Week" by Timothy Ferriss and "Good to Great" by Jim Collins. If you haven't yet read these books, make sure to pick them up. You'll be in for a treat -- they're both terrific reads providing real life examples which are educational and inspiring. Anyway, I digress . . . here's Kaihan's simplified approach to the whole Goal Setting process -- you can get this done in 30 minutes! Here's his simple process to quickly develop your goals, whether you are setting business goals or working on your personal "dream" board. This is your "Why" or your mission (if you rather) for setting your business goals. This is where you begin to establish the legacy you want to leave behind when you're no longer on the planet. This is "WHY" you get up every day. 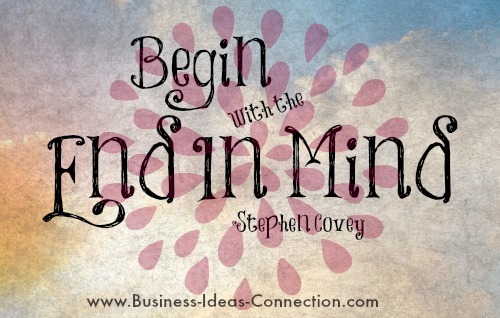 It is sometimes referred to starting with "the end in mind". This is the long-term view to of what you want your business to accomplish. Where do you want to be in the next 3, 5,or 10 years? How will you alight your accomplishments with your personal values? I don't know about you, but looking out 10 years when setting business goals is very hard for me to do. That seems so long away and so many variables change in that length of time. Personally, I need to break down my goals into smaller, more manageable bite sizes. This would be "The Next Chapter" of setting business goals. This is your shorter term business goals. Here you will determine if you are on the right path to achieve your long-term goals. This is the "taking action" step of setting business goals. This is where the "magic" and excitement happen. What 3-5 actions will you focus on to achieve your business goals and move onto the next "chapter" of your life? When you get overwhelmed (as I do from time-to-time), check your action goals to see if you are focused on the steps which you developed to achieve your business goals. Usually when I'm overwhelmed, I'm either trying to do too many tasks OR I'm not focused on the tasks I need to be focused on. Now you have the image of your long-term and medium term business goals along with action steps to get to the next chapter of your life. Next it's time for the specific steps and what you need to do now (at this moment) to get started moving forward towards achieving the goals you've identified. What 3-5 things will you focus on in the next 3-6 months to get you moving towards your business goals? This is what you will be doing now!! 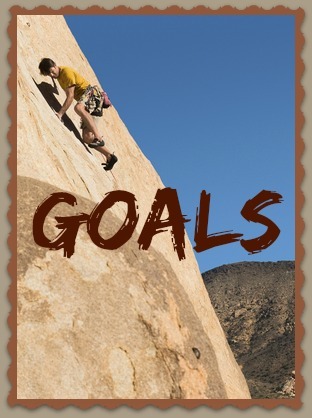 Setting your goals is crucial for the success you personally want to accomplish and for your business. Following the steps above will help you focus your time, energy, and resources to develop a solid road map for your life and your business. "The 30-Minute Strategy For Creating a Successful Path to Your Goals"
Setting Business Goals to Business Plans . . .